The EG Diner menu card doesn't mention the name of the restaurant. A typical EG Diner when it was open. When Euro Garages took over Little Chef, they had a year to stop using the brand name. Euro Garages intended to replace all of these with brands like Starbucks, but the project overran and in January 2018 36 Little Chefs were still open with just a month to go. 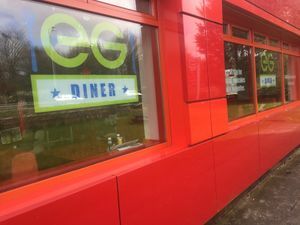 As a result, Euro Garages quickly created the name EG Diner to use instead. It was only intended to be a temporary solution to last for a couple of months until the refurbishment programme could be completed. For the first few months the closest it came to having any branding at all was a lot of bare signs and crudely-covered Little Chef logos, but in April 2018 a few branded vinyls started to be stuck to windows. Other signs would be stuck around the building with black-and-white photos printed on A4 paper, as staff did their best to get people in the doors despite management's apathy. 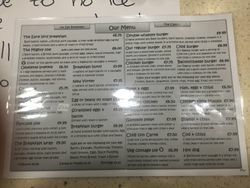 The menu was almost identical to the Little Chef menu, with trademark names changed and a couple of small price increases. It is printed on laminated paper with a small Euro Garages logo in the corner. The Early Starter, Olympic Breakfast and Jubilee Pancakes continue as The Early Bird, The Mighty One and Anniversary Pancakes, respectively. In January 2018, Euro Garages still didn't seem certain on what they would be doing with these establishments, which were mostly large restaurants. 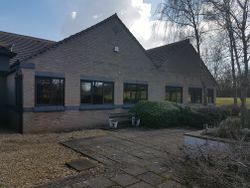 Some staff had previously suggested they continue as a diner and had been given the impression this would be happening, but Euro Garages were set on using names such as Greggs, Subway and KFC instead. By October 2018, the 8 remaining restaurants were told that any which hadn't been converted by the end of the month would be stripped bare, leaving any adjoining Burger Kings to soldier on alone. The whole point of Little Chef being sold to Euro Garages was that they would be able to ensure the staff still had work available. In truth, dissatisfaction with the changeover process, the change in job roles, the lengthy refurbishment period and the unwillingness to operate some branches all caused most staff to either quit or face redundancy.